My breed was developed back in the 19th century in Germany. My ancestry includes Pinscher, Rottweiler, Manchester Terrier and Pointer. 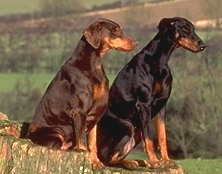 Because we dobermans have a ferocious reputation, we make excellent guard dogs. Most of us are really very kind and devoted to our owners. Our breed standard is supposed to censure vicious dogs, but it only takes a few bad dogs to give all of us a nasty reputation. I think this can be used to your advantage if you want your home or business guarded. You see, I'm a very loyal and disciplined dog, but as long as people think I might be vicious, my job is easier. You might say that I guard by intimidation rather than by brute force. Although I make an excellent outdoor pet, I usually tend to favor one family member. When fully grown, I am between 25 and 27 inches tall (63.5 to 68.6 centimeters) and I weigh between 66 and 88 pounds (29.7 to 39.6 kilograms). We have no Doberman Pinscher Breeders listed at this time. Click here to place your Doberman Pinscher Ad!